The news that Cowboys starting quarterback Tony Romo would miss the rest of the season with a back injury hit fans like a lead balloon Monday afternoon. It may have also saved Jason Garrett’s job. Of course, Garrett wouldn’t have wished this fate on Romo in a million years. But the ESPN report that shook North Texas two days before Christmas may end up being a lifeline to a struggling coach. For now, the exact severity of Romo’s injury remains uncertain (FOX Sports’ Jay Glazer later reported Monday that Romo has a herniated disc but has not been ruled out of Sunday’s game). But if Romo is out, where does that leave his head coach? Romo’s absence won’t save Monte Kiffin and his friends on the defensive side of the ball, but it will be difficult for Jerry Jones to can Garrett after watching him square off against a hot Eagles team â a division title on the line â without his best player. And if, heaven forbid, Kyle Orton leads the Cowboys to a stunning win this Sunday night, Garrett may end up with a contract extension. Don’t forget that Garrett was hired as head coach following the 2010 season, in part because the team rallied around backup quarterback Jon Kitna. In fact, I think Romo learned a great deal from watching how Kitna led the team that season. Still, losing Romo is a huge blow to the Cowboys’ chances in Sunday night’s game and beyond. ESPN reported that Romo’s herniated disc will require surgery. Dallas Mavericks team physician Dr. T.O. Souryal joined "The Afternoon Show with Cowlishaw and Mosley" on 103.3 FM ESPN on Monday and marveled at the fact that Romo played most of the fourth quarter Sunday with the injury. He said it’s possible Romo might be able to play through the pain, but added that it could expose the quarterback to further injury. Garrett listed Romo as "day to day" and left the door open for him to play against the Eagles. 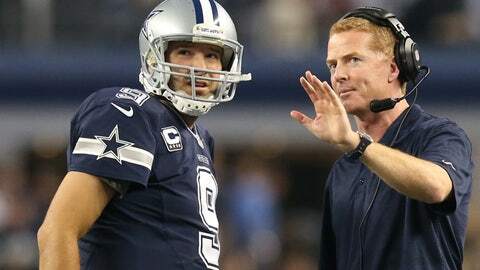 "We haven’t made that determination at all at this point," Garrett said Monday when he was asked if Romo would miss the rest of the season. But Garrett did say the Cowboys would look to add another quarterback to the roster. They will likely scour practice squads across the league while also looking for more experienced quarterbacks. Richard Bartel is a Grapevine product who was with the Cowboys organization in 2007 and part of ’08. He last played in the NFL for the Cardinals in 2011. He’s at least someone who knows Garrett’s offense. But with Romo likely out, this is all about Kyle Orton. He’s one of the highest-paid backups in the league because he’s started 69 games. He was the starter in Denver in 2011 until he was benched in favor of Tim Tebow. He then finished out the season with the Kansas City Chiefs. Garrett said Monday that Orton and Romo are similar quarterbacks. I’m not sure where he was going with that statement. Orton isn’t anywhere close to as elusive as Romo in the pocket. The one thing you can say is that he may be a little more inclined to stick with running plays that are called by Bill Callahan, if that’s indeed who’s calling the plays. But as strange as it sounds, this injury to Romo couldn’t come at a better time for Garrett. Jones was already gushing about him following Sunday’s comeback win over a dreadful Redskins team. If the Cowboys keep it close with an Eagles team that is now favored by more than a touchdown, Jones could be inclined to stick with Garrett. This isn’t the way Garrett wanted to secure his job, but it still beats getting fired. And if the Cowboys somehow upset the Eagles with Orton at quarterback, Garrett stands to be around for a good while. It’s not like Garrett will try to talk Romo out of playing Sunday night. But if No. 9 can’t go, don’t look for his head coach to shed any tears. For once, Kyle Orton will offer an NFL head coach some job security.